Iran’s President Mahmoud Ahmadinejad appealed to the American people during a live Q-and-A television show, saying his country's wanted peace and friendship with the U.S. despite mounting tensions between the two countries, the official IRNA news agency reported Monday. "If the U.S. leaders allow, then the situation of this country - Iraq - will be different," Ahmadinejad was quoted as saying. Ahmadinejad's comments comes at a time of heightened tensions between Iran and the United States. Washington was angered by Tehran's arrest earlier this year of four Iranian-Americans accused of plotting against the government. Iran, meanwhile, has protested the detention of eight Iranians by U.S. forces in Iraq. The United States accuses Tehran of helping to fuel Shiite militias in Iraq - charges Iran denies. Washington also says Iran is secretly trying to develop nuclear weapons. Iran denies those accusations, saying its nuclear program is for peaceful purposes including generating electricity. Despite Ahmadinejad's frequent anti-U.S. rhetoric, he has tried to appeal to the American people since he came to power in 2005. He opposed a law that imposed fingerprinting Americans upon their arrival in Iran and proposed direct flights between the two countries. But he failed to see both his wishes realized. 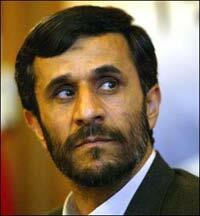 Ahmadinejad has also sent letters to the American people, in which he criticized Bush's Middle East policy.